And we're back! Haha, gosh. I felt bad not being able to finish in time before my trip, but I was so busy. It went well, but the following days have been some of the most miserable in recent memory. Still- I got it done! I wasn't expecting anyone to guess who was coming next- But of course, someone did. Dear Cannon guessed right off the bat. Haha! I should have known!Yes, these idiots from over a year ago! I did say they'd be back. Ohhh gosh. Jeffs dream come true x7! 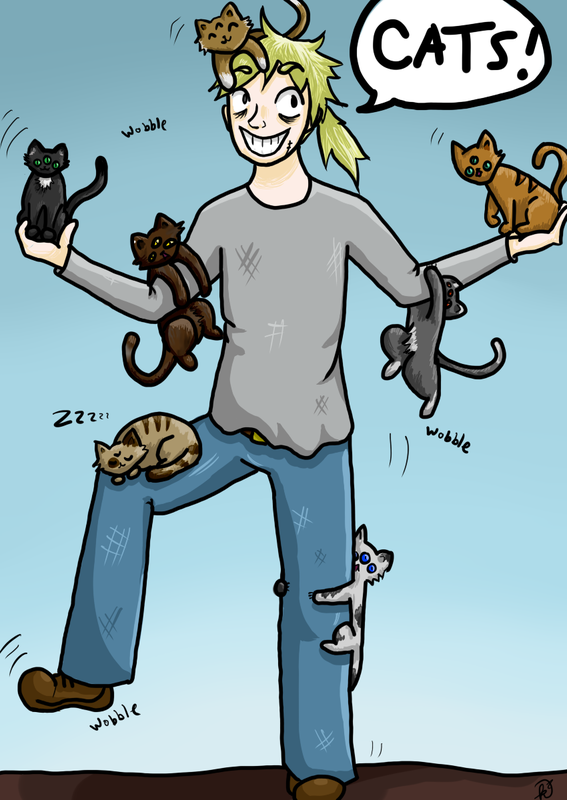 Oh man I adore everything about this, he looks SO happy, and all those kitties... Omg. They're all sooooo adorable!! You just don't mess with someones hat, I suppose! The Bro Code sayeth, "Never take another bro's hat without permission." Haha, these two are very amusing. Excellent page, my friend. They are back! At last! Ah, these two came back from the "taller head" days. He cannot even wear a hat like that. That is some paranoia to have your gas mask on all the time. It is a wasteland but the air seems to be fine for the most part. Unless it is filtering sand or such. That was a really good hat, though. It was indeed one swaggin' hat. I'd be salty if it went missing, too! This page looks great Sea! Powder will get thermite, a very hot burning explosive that needs very high temperatures to set off (like a blowtorch), and stump remover (potassium nitrate) and sugar when melted together make smoke bombs, remember though that you toss smoke bombs at the people who you want to get around, not at your own feet. Hopefully this will be helpful, if not that's ok. Again, Great comic!